For Dickens’ sake, please don’t tell! It’s almost Christmas and, in the—ahem—spirit of the season, we are back with A Christmas Carol’s Ghost of Christmas Present, who is about to tell that old miser Scrooge what’s what. ‘Ho, ho, ho, Ebenezer Scrooge, sit yourself down there, and let’s talk about you. A lonely child, left behind at school when all the other boys went home for Christmas; one sister, Fanny, frail body, big heart; she died young; one child, your nephew. You were devastated. All that resentment and bitterness, dude—not good for the soul. Then you were in love with Belle, and she loved you. Oh, yes she did. But it didn’t last. You were too ambitious, too greedy; it became all about the money: you and Jacob Marley grubbing and scheming, until there was nothing left to you but each other and your false idol. And now look at you: wizened and miserable. Do you know what you need, Ebenezer? A change of heart! You need to start caring about other people again. People like Bob Cratchit and his poorly son, Tiny Tim, who’ll surely die if you don’t start caring. And then you’ll end up dead yourself and unmourned. Nobody will even miss you; well, not for longer than a moment (your nephew really is a decent sort, you know). In fact, there’ll be some doing happy dances at the thought. Doesn’t really bear thinking about, does it? So here’s the deal: repent and redeem yourself, or die and suffer like Jacob Marley, with a long chain trailing behind you for eternity. A bit of a no-brainer, don’t you think? Right, got that? So, we’re good? Pleasure doing redemption with you. Must dash, other places to go and people to see, and next door has mince pies! Not quite Dickens, is it? But it does raise a number of interesting questions. 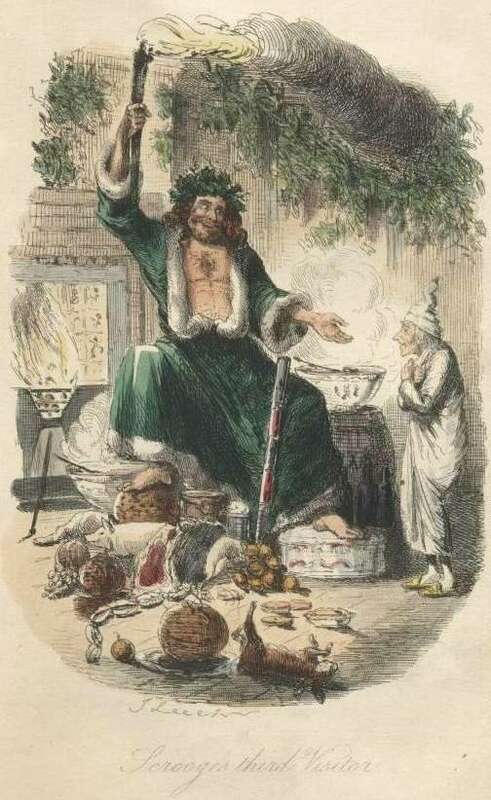 As a reader, the Ghost of Christmas Present’s charm, joie de vivre and his illuminating banter notwithstanding, would you expect the embittered, miserable, petty Ebenezer Scrooge as depicted in the first chapter of the book to repent, as the late, great Tommy Cooper would say, ‘just like that’? Would you believe Dickens if he tried to make you believe Scrooge would change so easily? I don’t think so. In fact, in those circumstances, I’d be inclined to believe Scrooge was correct when he surmised that the whole ghostly experience was likely the result of indigestion. No, all in all, I’d want a little more emotional and psychological incentive over and above the jolly warnings of a fat old ghost dressed like a Victorian Christmas tree. Which is exactly what Dickens gives his readers: he doesn’t tell us about Scrooge, he shows us using images, events and relationships to which both the reader and the character can relate. He carries us, just as the three ghosts carry Scrooge, on an emotional journey towards redemption, through the memories of his character’s past: the sad childhood, his devotion to his sister, his friends and first love—all possibilities in Scrooge’s youth for a different outcome—into the bitter-sweet present of the Cratchits and Tiny Tim, and the bleak future promised by a refusal to change. A Christmas Carol demonstrates very clearly the difference between showing and telling. You get the same facts by telling, but you don’t get the emotional connection that showing can give you. If you still don’t believe me, cast your eye over the Ghost of Christmas Present’s story once again. Who or what are we really focussing on when we read it: the Ghost of Christmas Present or the story he is telling us? Which of them is engaging us emotionally? Are we so busy being entertained by the ghost’s character and anachronistic style, that the story he is telling fails to move us enough to shed tears at the thought of Tiny Tim’s imminent demise? The moral of this Christmas tale: watch out for those tell–tale signs of telling: chunks of back story, exposition and information dumps, and replace them instead with scintillating dialogue, thrilling action and warm fuzzy feelings. Quotations and illustrations are from the 1843 first edition of A Christmas Carol by Charles Dickens, illustrated by John Leech. I raised the issue of being ‘in’ or ‘out’ of character in my earlier post ‘A Conspiracy of Coincidences’. But what exactly does this mean? In everyday speech, we would usually describe somebody as being ‘out of character’ if they do something we don’t expect. But, I hear you say, the whole point of my novel is that my character doesn’t do what everyone expects. And what about character nuance and complexity? Surely, my hero is allowed to be contradictory, or change his mind without being considered ‘out of character’? In fiction, as in real life, the key to being ‘in’ or ‘out’ of character depends on other people’s expectations. So the key to keeping your character ‘in character’ is to manage your reader’s expectations. Your character can change his mind and be as contradictory as often as he likes to all the other characters in the story, as long as it is clear to the reader that this unpredictability and contradiction are part of his essential nature, and not something tacked on by the author to get him out of a rather too deep and awkwardly constrictive plot hole. If your story turns on the fact that your character is going to face his demons and do something he has never done before, you need to prepare your readers in advance. Take Scrooge in A Christmas Carol, for example. His employer’s post-Ghost behaviour is so out of character for him that poor Bob Cratchit assumes the man has lost his wits entirely. So why are readers so willing to accept the curmudgeonly miser’s complete change of heart and personality? 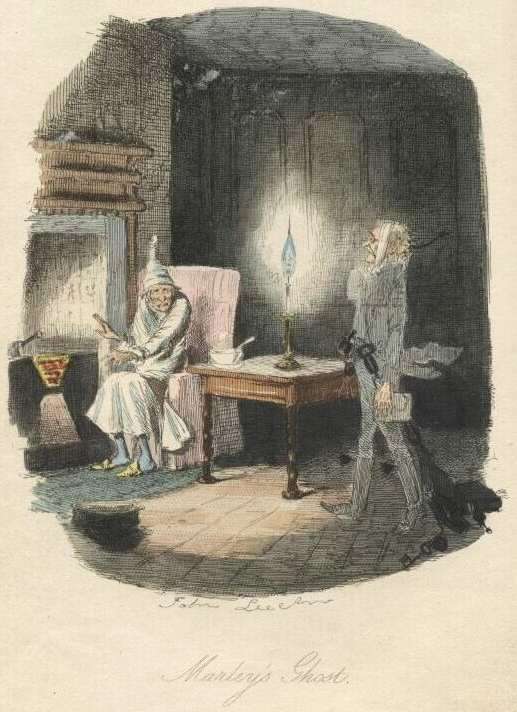 Because Dickens has set up the hope of redemption at a plot and character level from the start of the book: Jacob Marley’s ghost is a last chance warning to change before it is too late, and the Ghost of Christmas Past shows us a kinder, more innocent Ebenezer Scrooge just waiting to surface underneath all that miserly cynicism. Bob may not expect Scrooge’s redemption, but we readers do, and all is well. So don’t wait until your hero has his back firmly against the inescapable wall of whatever jeopardy you have in store for him before he discovers his hidden depths of character and abilities. Your readers won’t thank you for pulling convenient and hitherto unknown character traits from nowhere like rabbits appearing from a magician’s hat, but they will appreciate a carefully structured pay-off for all their emotional investment in a character. The subject of coincidence in plotting is a thorny one. Many years ago, a TV development executive told me that one of the key plot flaws they asked their script readers to look out for in a sample script was coincidence. If the story hinged on it or there was a pattern of rather-too-convenient events or coincidences, then more than likely the script would get the thumbs down. A little harsh, perhaps, but their view was that the presence of coincidences in a story would invariably lead to two killer audience complaints: ‘the plot was contrived’ or ‘the characters weren’t believable‘. Before the outcry begins, let me be clear that we’re not talking about the merely fantastical or serendipitous here: we’re talking about the type of plot coincidence in which it is clear that an author has essentially attempted to ram a square character into a round plot hole or vice versa. Take our two characters from ‘The Terrible Twos’: in the last post we left Character A battling her spontaneous combustion demons and trying to prevent Character B from being on stage—two interesting dilemmas (and obstacles to Character A’s objectives) keeping the audience engaged. So how do you think the members of the audience will feel if any or all of the following happens? (3) A letter arrives from Character B telling us that she’s decided to move permanently to the Caribbean and won’t be coming back. Fair enough, these ‘coincidences’ may seem a little too obvious, but the fact is that the more complex the story, the easier it can be to fall into the coincidence trap. You know you need a character to be at a certain place at a certain point in the story, and you just keep hammering away until you get them there, ignoring the instinct that is telling you loudly and clearly that something is just not quite right. We’ve all done it, and hitting that kind of plotting block can be hugely frustrating for a writer. One of best ways of sorting out these structural blips is to play the objective: this time not just the super-objective which drives the overall emotional arc of the story, but the small scene or unit objectives we spoke about earlier. So how do we get at these ‘unit objectives’ and how can they help with plotting our story? Essentially unit objectives derive from those other all-important dramatic building blocks: character and character choice. Each move, each action should involve your character in a choice. Whether the impetus behind it is conscious or sub-conscious is immaterial, but it should come from the character asking her or himself: what do I want to achieve and how do I make it happen? Let’s assume Character A above has reached crisis point: she needs to get rid of her ‘spontaneous combustion’ fear in order to achieve her super-objective. Perhaps hypnosis is the answer? But how to get Character A and a hypnotist together at this juncture? If she leaves the building, Character B will take her seat and A’s super-objective is finished. We can’t have our hypnotist simply turn up in a ‘here’s-one-I-called-earlier’ sort of way—that really would be a coincidence! But what if A could persuade someone to fetch one for her? What if she could somehow even manage to persuade Character B to fetch the hypnotist, thereby unwittingly causing B’s own downfall? Now that would be a psychologically interesting scenario. So next question, what strategy should Character A use to persuade Character B: seduction, bribery, brute force or all of the above? And what to do if Character B doesn’t take the bait? As you can see, each choice a character makes leads to another question and another choice. It also clearly pinpoints the intersection of character and plot because Character A’s answer to each question posed and each strategy choice will be determined by what type of person she is. We’ll look at the whole issue of being ‘in’ or ‘out’ of character in another post, but for now, suffice it to say that as long as A remains within character, then the action will push forward naturally and organically and accusations of authorial manipulation or contrivance can be avoided. Lastly, you shouldn’t forget that in building a story, you are not only dealing with one character’s objectives. Other characters, even minor ones, have objectives too, and their objectives can provide useful obstacles or assistance to help you weave what Sir Walter Scott called a ‘tangled web’ to keep your main characters under pressure (it’s that emotional arc again) and your readers turning the pages. What I’ve tried to show in previous posts are what I consider to be the vital ‘building blocks’ of dramatic conflict: objective and obstacle. Somebody sets out to do something and finds an obstacle in their way, often in the guise of another character with conflicting objectives. Crime procedurals are excellent examples of this: the detective wants to catch the bad guy; the killer wants to escape capture. Two objectives or wants at odds from the start and a good place to begin a dramatic journey. However, the other thing to bear in mind is that obstacles to achieving a character’s objectives are not necessarily external. They could well be internal: a fear, a phobia or a character flaw which a character has to battle in order to achieve their goal. Let’s return to our long-suffering Character A: in ‘The Terrible Twos’ we left her desperately trying to prevent Character B from sitting on the stage (because her objective is to be the only person seated on stage). But what if, even if she solves the Character B problem, she can’t sit in the chair? Or at least, she can physically, but something is stopping her psychologically, say, she’s convinced that she and the chair will spontaneously combust the moment she actually sits on it? This immediately ups the ante for the character: now she not only has to battle Character B, she has to battle herself as well. Of course, even with the intriguing, albeit macabre, possibility of poor Character A spontaneously combusting, wanting to sit on a chair is perhaps not the most exciting objective for a character. But what if the chair isn’t just a chair? What if it is a throne or a seat of power and the ‘stage’ is a country, kingdom or an empire? A throne is still physically a chair, but, clearly, it has significance and meaning over and beyond its practical use or function. Combining a far-reaching emotional or spiritual want or objective with a physical object in a character’s super-objective allows a writer to form a strong backbone for a story, whether it is genre or literary fiction. Thus Chekov’s Three Sisters and their yearning to return to Moscow: a physical journey which never takes place and which becomes a metaphor for their unfulfilled emotional wants and desires. Or George R.R. Martin’s A Game of Thrones which is basically a whole bunch of people striving to sit on a chair called the Iron Throne and gain the personal power over the Seven Kingdoms that comes with it. Which brings us back to our character’s emotional arc: to raise the emotional pressure we need to keep the stakes high for the character. When deciding on an objective to carry your character emotionally and physically through the length of a novel, the most important question to ask is: what does the character have to lose? The more they can lose by failing to achieve their objective, the better the drama.